Hoping everyone had a safe & festive holiday season! All of us here at t+j Designs want to thank you for all of the support this past year. We hope 2013 brings endless joy and happiness to you & yours! 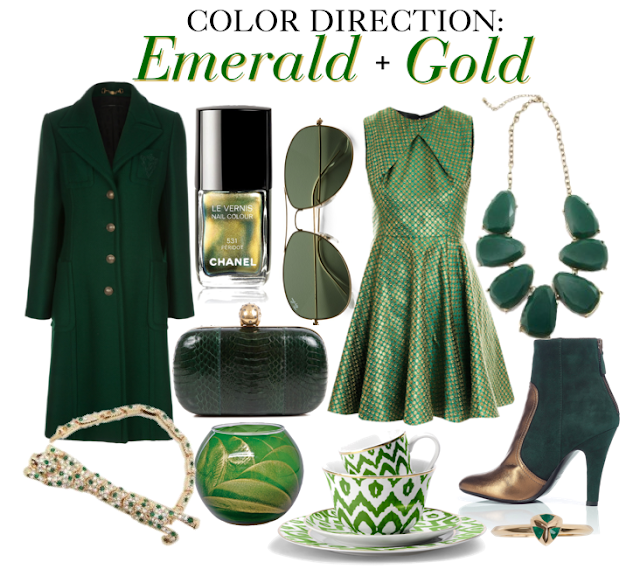 I couldn't think of a better way to start off this new year then by showcasing the chosen Pantone color for 2013, emerald! If you didn't know, emerald is a luxurious shade of green that received it's name based off the gemstone itself. I've noticed this certain green hue paired with gold everywhere lately, so I had to fill you guys in! I am absolutely obsessed with this Vintage Gucci coat. It is extremely elegant and gorgeous topped with gold buttons. Perfect for these chilly months...nothing warms you up like Vintage cashmere! Opening Ceremony flawlessly lives up to its cool stateside appeal with this Emerald dot brocade dress. This dress represents playfulness and luxury and would make an excellent addition to your cocktail-hour wardrobe. I am head over heels..literally..with these suede ankle boots by Laurence Dacade. The accent toe in metallic gold will add the perfect pop of shine to any ensemble. Speaking of shine...the jewels featured above are perfect to add some glimmer with your green! 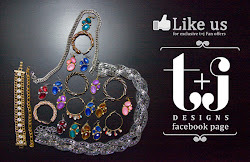 How amazing is the leopard bracelet from t+j Designs?! Let's be serious..who doesn't love animal print? And a ring or statement necklace like those above paired with a monochromatic LBD look is a great way to add just a little bit of on-trend color. Can't forget about the other gorgeous green accessories like the Alexander Mcqueen clutch and classic Aviator shades by Rayban! And why not take this trend all the way from your hands to your feet with this Chanel nail polish in Peridot! Products like these are more subtle options to incorporate this color-combo into you're already fabulous wardrobe! Finally, you can take this color direction to a whole new level with items for your home! I can't get over this dinnerware set by C. Wonder! The all-over tribal print & gold trim mix looks unreal! And how about a candle-holder in these stunning shades? Just choose a tea-light in your favorite scent and pop it in! How do you feel about this color-combo? Do you have any must-have green+gold products?